"To be a Pilgrim" - bringing the world's greatest adventure - story and the faith that inspired it - to life! 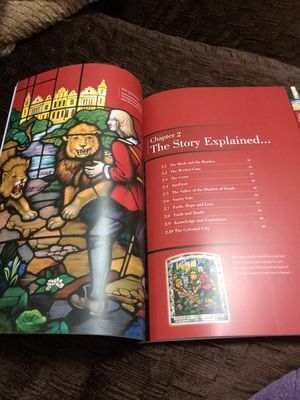 The Pilgrim’s Progress: A Curriculum for School was published in 2016 on the website Palace Beautiful, which was established by Ruth Broomhall specifically for this purpose. 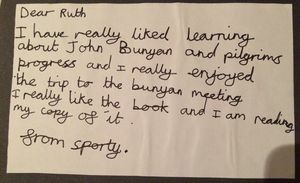 Ruth has over 25 years’ experience of engaging with The Pilgrim’s Progress as teacher, volunteer in charge of youth and children’s work at Bunyan Meeting Church, Master’s student and author. She is passionate about its ability to engage, teach, inspire and motivate both children and adults alike. The Curriculum contains everything a teacher needs to bring this amazing allegory back to life for children of all ages, from KS1 to KS3 and beyond. And whilst being overtly Christian, it is at the same time entirely inclusive, inspiring conversations on a whole range of spiritual, moral, ethical and contemporary issues. For the last three years Ruth has been working with a local multi-cultural, multi-faith school to write and deliver the Curriculum. Her vision is that one day every primary school, and perhaps even secondary schools, will be using it in some way to support the teaching of Christianity, the exploration of faith and the spiritual meaning of hope, love and mission, together with the importance of respect, citizenship, behaviour, aspirations etc. Children consistently prove the timeless appeal of the story, with many inspired to read it in its original form or to share it with family and friends. For teachers, the story and the resource is incredibly versatile and thorough. It can be used on its own or as a complement to other resources, including the LA syllabus and/or the recent Understanding Christianity. Alongside a suggested ten-week programme for R.E. (KS1 and 2/3), there are ideas for English, English and R.E., History, Geography, Enrichment, Drama and the Creative Curriculum. Allegorical and theological terminology and concepts are explained, alongside relevant Biblical passages, and Bunyan’s real-life inspiration for allegorical places, people and objects. Ideas for practical resources are available with the Curriculum. This Westhill project ‘To Be A Pilgrim’ is enabling every school in Bedford to receive a comprehensive resource pack on The Pilgrim’s Progress and 6 schools to undertake case studies utilising the different ways suggested in the Curriculum. Progress and final case studies will be shared nationally through this website, supporting and encouraging schools nationwide to engage with the story in their own classrooms. 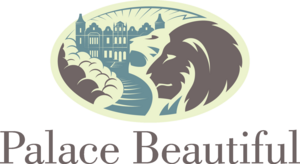 The Curriculum is available on its own or as part of a resource pack – see www.palacebeautiful.co.uk Ruth is also available to support schools with training and motivational days. On Wednesday 28th November, a group of enthusiastic volunteers from Bedford delivered John Bunyan Resource Packs to all schools in Bedford Borough, thanks to the Westhill Award. 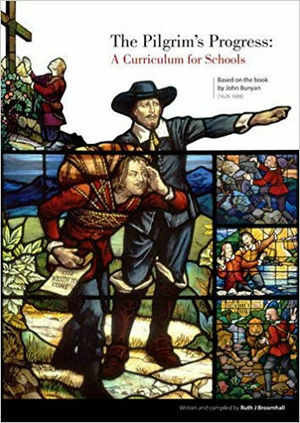 The packs included The Pilgrim's Progress: A Curriculum for Schools, The Family Pilgrim's Progress storybook by Jean Watson, a DVD, Travel with John Bunyan (gifted by Day One Publications) and resources from the John Bunyan Museum and Bunyan Meeting. It was a very successful day and a great start to the project for Bedford Borough. Ruth has started teaching at the first case study school: Livingstone Primary. Here she has taught two Year 6 classes about John Bunyan under the topic 'Inspirational People' in RE; and is currently teaching John Bunyan to two Year 5 classes as part of their local history studies. In January Ruth begins work with a class at Ridgeway School, Kempston, a school for students with special needs. Later in the Spring Term Ruth will be working with the Year 5 classes and their teachers at Great Denham Primary School to deliver The Pilgrim's Progress through the Creative Curriculum. The final three schools will be studying Bunyan in the Summer Term. John Bunyan and his amazing allegory is a brilliant resource for schools everywhere. If this project has inspired you to teach The Pilgrim's Progress to your pupils, then do get in touch with Ruth Broomhall (project leader) at ruth.jb@btinternet.com for further information and advice on the Curriculum and additional resources.